RSVP volunteers provide “Service as a Solution” matching their skills with the needs of more than 116 non-profit agencies in Snohomish County. We match people 55 years and over with meaningful volunteer opportunities in their community. 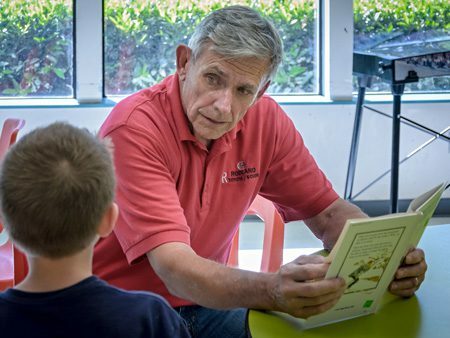 RSVP volunteers provide hundreds of community services they tutor children in reading and math, help police and fire departments, and serve in community food banks and senior centers. RSVP volunteers choose how and where they want to serve. Here is a chance to learn something new or contribute to a cause you have a passion for. As an RSVP volunteer you receive extended liability and auto insurance while you are volunteering. There are more than 400 volunteer opportunities available. Contact us to find one that fits you! Please contact the RSVP office and ask for John (425) 374-6374, if you are interested in any of these volunteer opportunities. RSVP works with food banks all throughout the county. Volunteers are needed to check in clients, stock shelves, re-package bulk materials, assist with selecting food items, loading into the car, picking up food at the grocery store and more. Food banks are in need of help ALL year long, not just around the holidays. Many senior citizens, living alone and on fixed incomes, are unable to do the most basic of household chores anymore. We are looking for those ‘angels on earth’ to help. You would be matched with a CCS client in your neighborhood and assist them with vacuuming, laundry, dusting, changing sheets and so on. Some of these seniors would not be able to stay in their homes without this help. Can you spare a few hours each month? Many people in our community do not own cars. These same people are often elderly, on fixed incomes and need to see their doctor on a regular basis. If you can spare a few hours a day, week or even month, you can help. If you have a safe running vehicle with working lights, brakes and horn, a good driving record and the desire to be of assistance to others, this is for you. Clients can enter and exit the vehicle on their own and you are reimbursed for your mileage. When you volunteer for Academic Link Outreach (ALO) you are helping the future. ALO works with low-income students who might not have the help they need at home to do their best in school. ALO provides students with structured, caring and supportive mentoring. You can work with students one on one and help these kids prepare to go on to high school and college and have a rewarding life. Former or retired teachers at the middle school and high school level are wanted especially. This opportunity is in Lynnwood. Are you a good listener? Do you like helping people? Then consider being a Peer to Peer counselor. In this program, you receive 40 hours of training and are matched with a person over 60 experiencing an emotional challenge or difficult life transition. Loss of loved ones, health problems and many other age related changes can lead to depression, isolation and anxiety. You are trained to listen and offer support and new ideas to seniors who can’t afford to pay for counseling. You and the client set the time to meet for 1 hour a week. Periodic status reports are given to the mental health counselor and there is ongoing training. A six month commitment is required. Note- You must be at least 55 to qualify for this volunteer job.